Jennifer Weiner is considered one of the queens of Chick Lit fiction. Yet, I just didn't care for her books. Or I thought I didn't. A couple years ago, I read one - mostly. I skimmed most of the second half. For some reason it didn't appeal to me. "In Her Shoes" was made into a movie that I tried to watch on a long, tedious (is there any other kind?) flight and again didn't care for it. But after grazing the fiction at our local library all the way to the W's the other day, I decided to give her one more try. A good choice. Best Friends Forever is funny and touching - a very pleasant read. Her characters are revealed layer by layer alternating between the humorous snippets and the dramatic points of their lives. Now I'm reading her first book, Good in Bed, and I can't put it down. I've really got other things I need to be doing and I keep picking up this book! So I'm really glad I gave this author a second chance. The bookmark above is made from Basic Grey's Indian Summer collection. I had the papers out using some of the chocolate and rosy ones on Valentine's day cards. 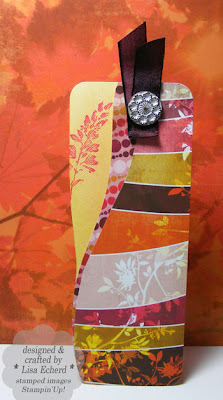 This collection works really well with the In Colors this year from Stampin' Up! Ingredients: Stamps: Petals by Stampin' Up!